OSWEGO, NY – As a part of the Thrive Oswego County Community Incubator initiative, the Office of Business and Community Relations at SUNY Oswego will host the Oswego County Community Awareness Regarding Exceptional Services (CARES) Expo. The expo will showcase a wide range of human services available to Oswego County residents, as well as several mini seminars of community interest. The CARES Expo was created in partnership with the Rural Health Network’s Co-Morbidity Task Force and is co-sponsored by the Office of People With Developmental Disabilities Family Support Services Council. It will be held on May 9 from 1 to 6 p.m. at the SUNY Oswego Campus Center Arena. The CARES Expo is on the heels of the success of the innovation Rainforest Launch and workshops recently facilitated by Greg Horowitt, venture capitalist out of California. Thrive is sure keeping the momentum going. The children’s activities will be provided by members of Kappa Delta Pi (International Honor Society in Education) and Alpha Phi Omega (national co-ed service-based fraternity) led by SUNY Oswego student Keri Frazer, President of Kappa Delta Pi, and graduate student Jon Zella of the Civic Engagement Coalition. The Oswego County CARES Expo, children activities, and seminars are all free for Oswego County residents.Attendees will each receive a directory of services available in Oswego County. Parking will be provided in Lots E-31, E-1 and E-18, with overflow in EC-7. The Second, “Strategies for Advancing Women’s Success” In the Campus Center Auditorium (132) 6:00 pm – 7:30 pm. Jocelyn Egan, senior vice president of Discovery Solutions and a 1984 SUNY Oswego graduate in marketing, will talk about her career experiences and give audience members advice about lessons she learned on the road to success. Part of the Ernst & Young Lecture Series. 1st place (top picture) won $2,000 for his school’s science department (Central Square) as well as a trip to the International GENIUS Olympiad this summer. There was also a “Directo’s choice” from the Director of the International GENIUS competition who will also be presenting this summer from Fulton. Congratulations to all the winners and thanks to Fulton and Central Square schools for participating this year! 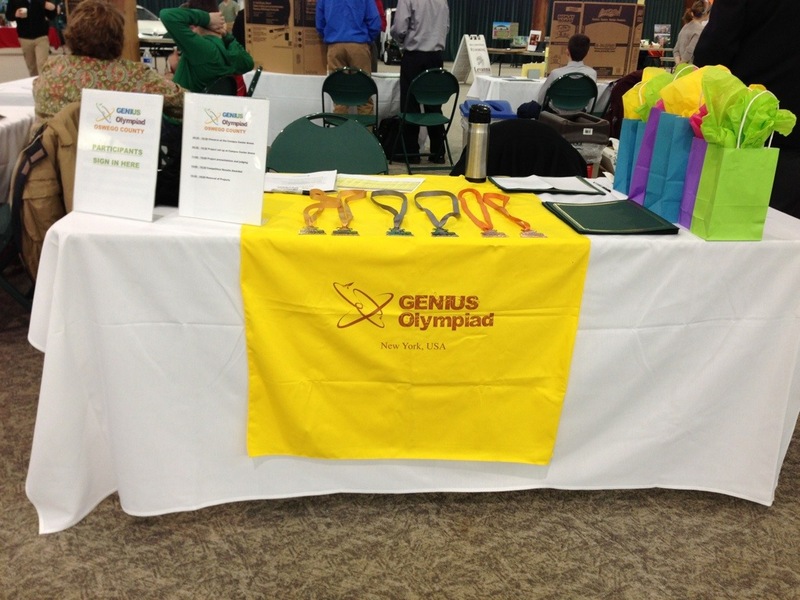 We’re here today at SUNY Oswego’s Sustainability Fair hosting the Oswego County GENIUS Olympiad. Students from Fulton City Schools and Central Square Schools created sustainable and environmentally related projects for a chance to win money for their school as well as move on to the State and National GENIUS competitions. This morning we sat down with Greg Horowitt, professors, students, faculty, and President of SUNY Oswego Deborah Stanley to talk about today’s events and how they could influence the university and the greater Oswego community. The Thrive program will try and develop a new blueprint for Oswego’s future, says Jeff Grimshaw, the director of business and community relations at SUNY Oswego. He notes new businesses starting out of their incubator would certainly be a positive. But the bigger goal is community engagement. Grimshaw says Oswego has some good ‘people capital’ with the young people from the college. We had an amazing turnout last night for Greg Horowitt. Thank you to everyone who came out and supported growth, innovation, and the Oswego community.